There’s no debating how effective traditional metal braces are for correcting moderate to severe orthodontic issues. But they’re certainly not for everyone. 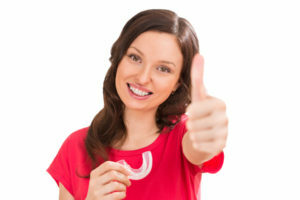 Since 1997, Invisalign has become a favorite among those requiring or preferring a clear alternative to orthodontic corrections. In fact, they’re so popular that anyone can request Invisalign from 50,000 dentists and orthodontists across North America. 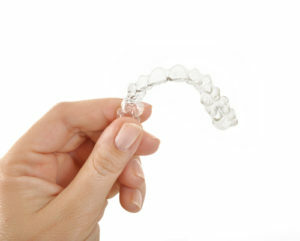 Of course, to get the most out of your Invisalign braces treatment you’ll know how to properly care for your aligners. Here are some simple tips to get you started. Your aligners will come in two color-coded cases with complete instructions on how to be stored. Use the appropriate case whenever they’re out of your mouth. And always keep the right case with you. Life happens, and a snack or impromptu outing with a friend or coworker can lead to an accidentally forgotten or tossed aligner. What an expensive mistake! Keep them away from kids and pets as well, unless you want your aligners used as a chew toy. According to the American Dental Association (ADA), brushing your teeth twice and flossing once is the best way to maintain healthy teeth and gums at home. This practice should continue after getting your Invisalign aligners. However, your Manhattan cosmetic dentist may suggest lightly brushing after each meal and snack as well. Follow their instructions to ensure you get your new beautiful smile as quickly as possible. Your aligners will be in your mouth and exposed to everything your teeth and gums are. So it’s crucial they’re cleaned every time they’re removed. Replacing them in the mouth without cleaning can encourage decay to set in and lead to extra problems you really don’t want or need. But using harsh detergents or even toothpaste can discolor, scratch, or leave chemical burns on the aligners. Mild detergent or soap is a better option, or you can discuss other safe solutions with your dentist. It may seem like a good idea to soak your aligners in denture soak, Listerine, or another type of mouthwash. But that’s a serious mistake. Invisalign aligners are customized to be strong enough to correct specific orthodontic issues. But those products contain chemicals and dyes that can damage and stain the aligners. If you feel the need to soak them in anything, opt for warm water only. Invisalign offers plenty of freedom compared to traditional braces, so you never have to miss out on life. But you will need to remove them for specific reasons. 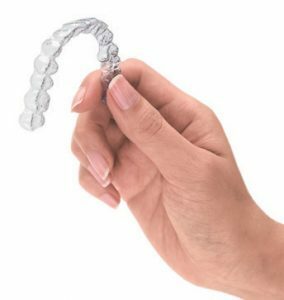 Your Invisalign braces treatment will only be effective if you follow the rules, and one of the main ones involves wearing them for at least 22 hours each day. The only time they should be removed is during meals, snacks, and for cleaning purposes. Never eat anything with your aligners in. Remove them to enjoy hot beverages. And avoid chewing gum as it sticks to the aligners. If you have any issues or concerns, be sure to contact your Manhattan cosmetic dentist for further suggestions or assistance.